Virtually every business and organization has documents that contain valuable information. From personnel records, to customer files, financial statements, and corporate documents – valuable data is now the leading currency for criminals worldwide. Regulatory compliance because professional secure shredding services provides a certificate of destruction for your records. Many industries, such as banking and healthcare, must comply with strict state and federal regulations for handling sensitive information. These laws are designed to protect personal information and carry stiff penalties for organizations that fail to comply and put individuals’ personal information at risk. If you’re attempting to destroy old but valuable documents using a standard office shredder, you may be putting your firm at risk of data loss that can be costly. 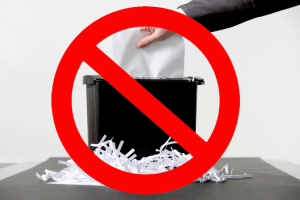 Secure, professional shredding is one of the most efficient and effective solutions for minimizing the threat to corporate and personal information posed by poorly discarded printed and digital documents or files incompletely destroyed by a low-quality office shredder. A professional, responsible secure shredding service provider such as Data Destruction Services, LLC uses trained, uniformed, and clearly identified staff to pick up, transport and shred your sensitive documents at a secure shredding facility. Contact us today to learn more about how a professional data destruction service beats a retail office shredder hands down.